From the start, the Astronomik OIII filter has been very specifically designed for the visual observation of gaseous and planetary nebulae. The extremely narrow pass band of the two OIII lines brings a substantial contrast gain to these lines even under best observation conditions. On faint super nova remnants and faint planetary nebulae the Astronomik OIII filter will often make the difference as to whether the object can been seen or not! The optimal aperture ratio for the use of the filter is 1:3 to 1:15 with apertures of more than 6" (150mm). 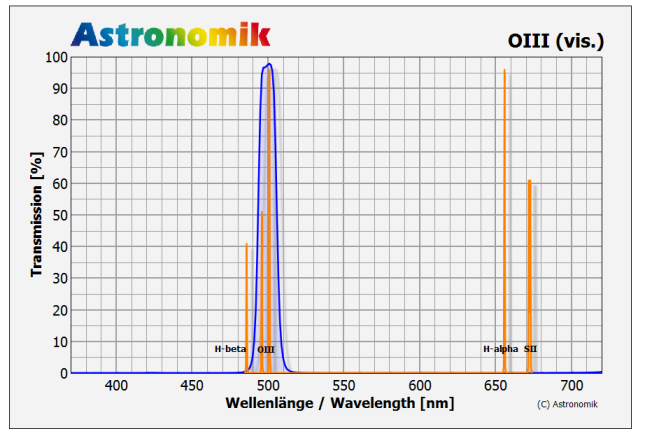 Transmission losses and chromatic distortions, which arise with other filters, occur with Astronomik OIII filters only when extremely bright aperture ratios of 1:3 and more come into play. The Astronomik OIII filters thus can expand the view of dispersed objects, generally speaking, to the whole visual field of view of the eyepiece and are not limited to only the center of the eyepiece.